I read Hulda Clark’s book several years ago, but never needed to try one of her suggestions to kill parasites (the root of all disease according to Dr. Clark) until I recently suffered from colitis that even antibiotics didn’t alleviate. My chiropractor had a “Zapper” which uses a special electric impulse to kill parasites and other pathogens. I used it one night and the next morning I was fine. So, I read the book again and found other gems of advice in it. You, as the reader, may not agree with all her hypotheses, but many of her suggestions have proven to be invaluable, such as using products without fragrance and added chemicals. For instance, I’m never without Borax. 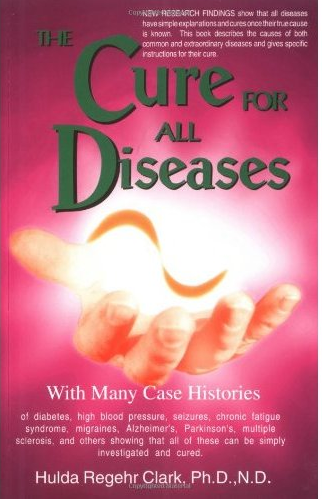 This nearly 600-page book offers a wealth of information on alternative approaches to cure everything from cancer to ulcers. According to Dr. Clark, there are only two causes of health problems – internal parasites, which can be cured with the electronic treatment of the Zapper. The external cause of health problems? She cites pollution, both in the environment and the products we use on our bodies, in our homes, and in the food we eat. The simplest cure for this she advises is avoidance. In our society, it’s virtually impossible to avoid chemical pollution, but this book offers sage advice on controlling what you can. It’s a book I have lent to many people, and will continue to do so. Dr. Clark has been a bit persecuted by the American Medical Association and I believe now runs a clinic in Mexico. For many years, she had a company that sold “Zappers” for a reasonable price, then she stopped selling them because of this “persecution.” I recently spoke with her onlne store, www.DrClarkStore.com, and found they will be carrying them again next month. You can also follow her instructions to make your own Zapper in her book.